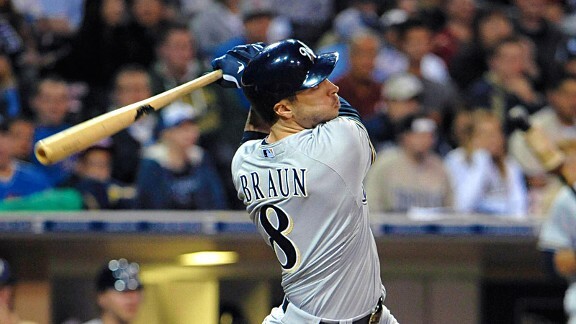 The Obvious: Ryan Braun - Since we talked last, Ryan Braun has continued to put up productive numbers. Since May 21st, he's hit 12 HR, 37 RBI and batting .302 in June and July. He is sitting at 998 career hits heading into the series against Cincinnati. I'm going to say that if he's healthy, he's going to have more than 2 hits in that series. He's sitting at 26 HR, 65 RBI, and batting .309 and is well on his way to a second MVP Award. Ryan Braun is currently on pace to hit 47 HR and 116 RBI, which would make him a serious candidate for an MVP. Corey Hart's Gold Glove Transition to 1st Base - Who would have thought that Corey Hart would have played this much at first base at the start of our season? Well, because of injury, he has taken over the helm of the corner and has done a tremendous job at that. He is currently errorless over at first base since playing there full time (knock on wood). And, his bat hasn't slowed down one bit. His average is at an acceptable but improvable .262, but has 17 HR, 44 RBI and is currently on a 12 game hitting streak. His production needs to stay this way if the Brewers want anything to do with the postseason in October. The Spark of Norichika Aoki's Bat - Aoki has clearly found his groove and transitioned nicely to American ball. Earlier in late June and early July, Aoki had a 14 game hitting streak, batting almost .400 during that stretch with a considerable amount of runs scored and stolen bases. Aoki has also taken the role as the Brewers regular lead off hitter, with the exception of Carlos Gomez in there once in a while. He is batting .288 with 5 HR, 20 RBI, 30 R, 24 BB and only striking out 30 times this year. With this guy on base the way he has been, it's got to make hitters like Ryan Braun and Aramis Ramirez happy to show off their production value. Manny Parra's Dominance - I'll keep this short and sweet, because that's what I do. In his last 10 appearances, Parra has put up ridiculous numbers. His stats read 8 IP, 13 K, 1.13 ERA, giving up only 3 hits, 3 walks, and 1 earned run with a batting average against of .167. That is all. Thank you. The Lack of Depth for Pinch Hitting - It's tough to call this bad, just because of the personnel that assumes this role for Milwaukee. Travis Ishikawa and George Kottaras are our strong points that we generally go to, and both have struggled tremendously when called to the plate late in game. Kottaras usually swings at 3 pitches and strikes out, while Ishikawa will swing at the first pitch and either pop it up or ground it out. Other guys off the bench like Morgan, Izturis/Ransom, and Bianchi are really high risk, low reward hitters, so generally they are Plan B and C pinch hitters to begin with. If we don't become sellers later this month, this will be something management will have to address. It really makes you appreciate how great Kotsay, Hairston Jr., etc. were for us last year. The Struggles of the Ax-Man - This is one I really didn't expect to put in ugly after my first review of the season back in early June. I honestly have no explanation for what has happened to John. But here's what I can say to defend him the best I can. Everyone struggles. Everyone has slumps. It's how baseball works. And it goes for both sides of the ball. The best hitters struggle at times (See 2012 Albert Pujols). The best pitchers struggle at times (See 2012 Tim Lincecum). It just happens. With KRod in as the Brewers closer for the time being, John Axford will work out of the bullpen to find his groove again. 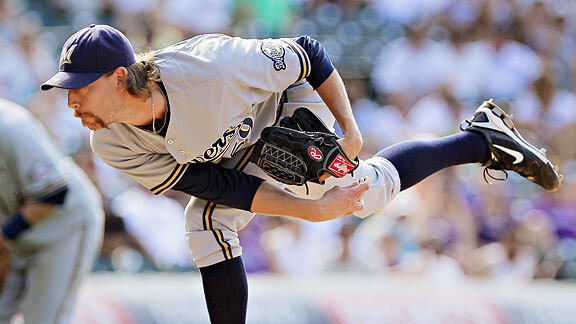 Now, a lot of you reading this have made the collation that John Axford is the next Derrick Turnbow. Now, it is obvious why you make that connection. It seems fair. But, it's not. I had a conversation with @BrewerNation at the game against the Cardinals, which was the first game in which Axford had been removed from the closer role and we had a lengthy conversation about this "relation". The difference between the two is that Axford only struggles when he can't control his curveball. Turnbow couldn't control any of his pitches, but most importantly his fast ball. Axford's general pitch selection is fastball wherever, curveball for a strike, fastball high. If Axford isn't feeling that curveball for a strike, he's forced to throw too many fastballs. Turnbow would serve up his fastball down the middle more often than not, leading to his removal. Now, I will say that I don't like the fact that Axford goes to Twitter after his bad games and interacts with nobodies who talk meaningless things in his direction and than retweets them etc. I personally don't think those people deserve the time of day to even be mentioned by Axford. Bottomline, Axford's excuses need to go. He needs to get comfortable again. I like the fact that after Axford had a day off to clear his head, manager Ron Roenicke used him in a situation that tested his will power. Axford came in to relieve Tyler Thornburg with a man on base with 2 outs. It was a situation where he needed to throw strikes, and he delivered. Axford also went on to throw a scoreless 6th inning as well. Progress people, progress. We haven't seen the last of Axford as Milwaukee's closer. Honorable Mentions - Aramis Ramirez and Rickie Weeks both started out the season with miserable slumps, Weeks being far worse as we all know. You'll notice I highlighted the "k's" and "e's" in Rickie's name. That's because the only things he needs to still improve on are his errors (E4s) in the field and his strikeouts (Ks) at the plate. However, in the past month, both have really become hot hitters for the Brewers. Since June 1st, they have combined for 9 HR, 46 RBI. They need to continue hitting the ball well to help turn things around for Milwaukee. The Bullpen has continued to disappoint, especially Kameron Loe. I can't continue with this blog without mentioning how awesome Martin Maldonado has been in the absence of injured catcher Jonathon Lucroy. He is batting .273 with 5 HR and 18 RBI since being called to duty on May 29th. Oh, and his defense behind the plate has been superb. Unless a trade occurs that sends Kottaras somewhere, it's going to pinch when we have to send Maldonado back down to Nashville. Wrapping this up, I couldn't really think of a spot to place our starting pitching. They really haven't been good, but they haven't been bad either. And certantly not ugly. Mike Fiers has been insanely good for us. Wolf has been good as of late, except the bullpen hasn't supported him whatsoever. Gallardo and Marco Estrada have been strikeout machines as of late. And Greinke, although his July has been awful, has still done a good job for the most part. Rank the rotation where you must.